Gottlieb, Robert. “Introduction: Where We Live,Work, and Play,” and “Resources and Recreation: The Limits of the Traditional Debate.” Introduction and Chapter 1 in Forcing the Spring: The Transformation of the American Environmental Movement. Rev. and updated ed. Washington, DC: Island Press, 2005. First published 1993. 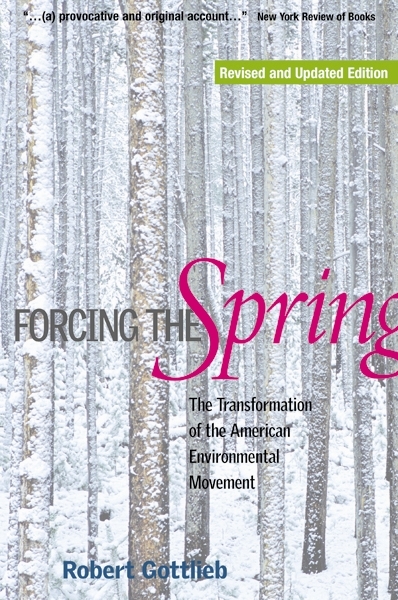 Originally published in 1993, Forcing the Spring links the environmental movement that emerged in the United States during the 1960s to earlier movements that had not previously been defined as environmental. It is unique in its consideration of the importance of race, ethnicity, class, and gender issues in the history and evolution of environmentalism. The revised edition extends the groundbreaking history and analysis of Forcing the Spring into the present day. Additional topics addressed include: the controversy spawned by the original edition with regard to how environmentalism is, or should be, defined; new groups and movements that formed around the turn of the twenty-first century; change and development in the overall environmental movement from 1993 to 2004; the impact of the 2004 US presidential election; and the emergence of “the next environmentalism.” (Island Press website text, please see link below).